On August 3, 2010 I wrote that my first paper reached exactly 100 citations on Google Scholar. Now my second publication, a UIST 2004 paper, has exactly 100 citations as well. Coincidently, we will host UIST 2013 in St Andrews next year. I have previously written about how some open access publishers spam researchers for submissions and demand high fees to publish papers and book chapters (here, here, here and here). Beall’s List of Predatory, Open-Access Publishers (2012 Edition). As I suspected, the website lists both InTech and Bentham. I have blogged before about how low-quality open access “publishers” indiscriminately spam researchers for manuscripts for the most ridiculous journals and “edited books” (here, here and here). The peer-review and quality-control appears to be minimal and the publication fees are outrageously high. Now The Chronicle of Higher Education has an article about how ‘Predatory’ Online Journals Lure Scholars Who Are Eager to Publish. It is excellent and very important this is brought to attention. There is of course nothing wrong with a desire to communicate research in the form of open access articles. However, having tax-funded researchers paying ridiculously high fees for someone essentially hosting PDF files without any real peer-review whatsoever is a huge waste of tax money. Even worse, having researchers passing these “publications” off as properly peer-reviewed scholarly articles is essentially a form of academic misconduct in my view. Yesterday I attended the Second Workshop on Speech and Language Processing for Assistive Technologies (SLPAT) in the Informatics Forum at the University of Edinburgh. It was held in conjunction with ACL’s annual conference on Empirical Methods in Natural Language Processing. Last Thursday I had presented a paper on our work on AAC language modelling work at EMNLP. Therefore, even though I did not have anything new to present at the workshop, the SLPAT workshop was of high interest to me. I have attended quite a few workshops before and my impressions so far have been mixed. Sometimes workshops fail to attract high-quality papers. Other times the organisation is in chaos. Very rarely do the workshop organisers manage to get everything right. Therefore I was very pleased to note that SLPAT 2011 managed to both attract high-quality workshop papers and deliver on an ambitious workshop schedule that packed the day with talks interwoven with user panels, posters and demonstrations. Besides the talks, two other features stood out. First, the workshop had two ambitious poster & demo sessions. Demonstrations included a Lightwriter, a popular text-to-speech AAC device. I had never used one before and it was instructional to learn how it was designed. I also think it was a brilliant move to invite the AAC vendors Toby Churchill and Tobii to the workshop. I think researchers in AAC have a duty to try to interface with industry and government so that our research results can translate into actual benefits for end-users. Related to this point, another feature that stood out was the AAC user panel. The organisers had invited AAC users to deliver prepared speeches about their reflections and ideas of AAC based on their own first-hand experiences with AAC devices. Thereafter the audience had an opportunity to ask questions. It was a very instructional session and also a reminder to me about just how much AAC devices can still be improved. I was also amazed by the eloquence of some of the talks delivered. In summary, SLPAT 2011 was a highly ambitious and well-organised workshop. It was run just as well as a full conference, albeit for a smaller and perhaps more dedicated audience. I had a great time, I met lots of interesting people and I learned a lot. I will definitely try to attend the next workshop. 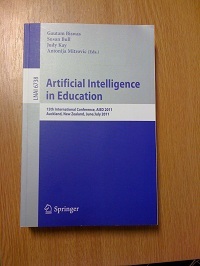 I recently attended the 2011 Artificial Intelligence in Education (AIED 2011) conference in Auckland, New Zealand. The main focus of the AIED conference series is various approaches to designing and evaluating intelligent tutors. An intelligent tutor is basically a computer program that uses AI techniques (such as planning algorithms) to teach students new concepts or techniques based on a model of what the students already know, or are supposed to know. The conference is quite old, this was the 15th biannual conference. The conference is organized by the International AI in Education Society. It also seems that the AIED conference is liaised with the Intelligent Tutoring Systems conference (ITS) so that ITS runs every even year and AIED runs every odd year. Collectively ITS and AIED publish the vast majority of new research in the intelligent tutoring field. I was at AIED to present a poster on the first steps towards designing intelligent tutors for text entry methods. The idea is to increase user adoption of novel text entry methods by using highly effective and engaging intelligent tutoring. I wouldn’t classify myself as an intelligent tutoring researcher so attending this conference was a good opportunity to get an insight into the field’s frontier. 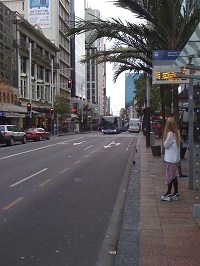 The conference was held at the Faculty of Engineering at the University of Auckland’s city campus. The conference had a poster session, an interactive event, and three parallel paper tracks. In my opinion the overall organization of the conference and the program worked out very well. The presented papers fell into three categories: systems, user studies, or data mining. I learned that the latter is apparently so popular that people have felt the need to start a conference on just that, the Educational Data Mining conference (EDM). I also found that machine learning is becoming increasingly popular in intelligent tutoring systems. Some of the machine learning techniques people used were POMDPs and Bayesian models. An interesting concept I didn’t know about before was Open Learner Models (OLMs). OLMs exploit the fact that while a student is using an intelligent tutor the system develops a model of the student. The idea behind OLMs is to figure out how to present the entire model (or aspects of it) to the student. Presumably this can aid the student’s learning. Some of the papers presented intrigued me. In particular a paper on motivational processes seemed to point in good directions and another paper on confusing students (!) had led to some rather surprising results. I also found out that another active research area is authoring tools for ITSs, some which use techniques from the end-user programming field. Overall I very much enjoyed going to this conference. It was refreshing to learn about an area of research outside of my comfort zone. Time will tell if I will submit a full paper to AIED 2013! The previous post described various commercial open access publishers spamming for book chapters and journal articles. Now I read that Phil Davis at the blog The Scholarly Kitchen sent a SCIgen-generated nonsense manuscript to “The Open Information Science Journal” published by Bentham. Four months later Bentham accepted the paper and offered to publish it for a $800 fee. No reviews were provided with the acceptance letter. It looks like at least some of these commercial open access publishers are essentially vanity presses that will publish anything for a hefty fee. It is a shame they are doing this since they may drag down the reputation of reputable open access publishers, such as PLoS. Another danger is that we will see even more use of pseudo-scientific rankings and measures of the impact of journals based on citations just so that people can filter out all the meaningless junk. I suppose no one is any longer interested in reading the actual articles. In defense of open access journals, a journal called “Applied Mathematics and Computation” which has been published by Elsevier since 1975 has apparently also accepted an automatically generated nonsense paper. Judging by how much spam I get nowadays it seems academic open access publishing is lucrative. I keep getting targeted spam from Bentham, Hindawi, InTech, and others. The strategy seems to be to mine reputable conference and journal papers for email addresses and then use them for targeted spam. My name is MSc Iva Lipovic and I am contacting you regarding a new InTech book project under the working title “Speech Technologies”, ISBN: 978-953-307-152-7. This book will be published by InTech – an Open Access publisher covering the fields of Science, Technology and Medicine. You are invited to participate in this book project based on your paper “Automatic Selection of Recognition Errors by Respeaking the Intended Text”, your publishing history and the quality of your research. However, we are not asking you to republish your work, but we would like you to prepare a new paper on one of the topics this book project covers. Why on earth would I spend time and effort to write a book chapter for a random individual I have never heard of and who doesn’t seem to have any credentials whatsoever in the field? And who reads these book chapters? And what exactly is the point of an open access “book chapter”? Sounds like a web page to me. With the exception I have to pay InTech plenty of money to put it up. I might as well just make the text available on the web myself. I am writing to invite you to submit an article to “EURASIP Journal on Audio, Speech, and Music Processing,” which provides a rapid forum for the dissemination of original research articles as well as review articles related to the theory and applications of audio, speech, and music processing. EURASIP Journal on Audio, Speech, and Music Processing is published using an open access publication model, meaning that all interested readers are able to freely access the journal online at http://www.hindawi.com/journals/asmp/contents.html without the need for a subscription. abstracts of recent issues and other details. I keep wondering who is actually editing and reviewing all these journals and books. While they keep spamming me for paper submissions (and lucrative fees after they have accepted the papers), I haven’t received any invitations to do any reviews. The idea that you can rank universities in the world has to be one of the most misguided ideas ever conceived. The assumption must be that all universities in all countries have the same objectives. If this isn’t true, the ranking is meaningless. 10%: Alumni winning Nobel Prizes and Fields Medals. 20%: Academic Staff winning Nobel Prizes and Fields Medals. 20%: ISI Highly Cited Researchers. 20%: Articles published in Science and Nature. 20%: Papers published that are indexed by the Science Citation Index (SCI) or the Social Science Citation Index (SSCI). 10%: Per capita academic performance of the above indicators. Now, assume I am a worried university administrator. How can I improve my institution’s ranking? Greatly expand research in selected areas of medicine and the natural sciences that tend to have articles published in Science and Nature. Expand selected areas in engineering that publish in easy-to-publish IEEE conferences and journals that are indexed by SCI. Better yet, require all undergraduate and graduate students to publish about six or so “SCI papers” with their advisor’s name on it to get their degree. Also: Make sure you work in an institution which is at least about 100 years old and have focused on medicine and the natural sciences in the past. Remember: Nobel Prizes collected by staff and alumni over 50 years ago, they still count! I leave it up to someone else to decide if such a rank-optimized university is what should characterize every university in the world. I just noticed that according to Google Scholar my first publication, a CHI 2003 paper, has exactly 100 citations now. It seems to be my most cited paper so far.